Drinking plain water can get monotonous at times. You can always opt for fresh fruit juices, but then you may consume extra calories. Another simple way to keep yourself hydrated is drinking cold lemon water. Drinking cold lemon water benefits us in many ways—it serves as a healthy beverage and is a good replacement for aerated drinks. Lemon water is refreshing, good for our skin, and keeps us hydrated. However, if you aim to improve your metabolism, lose weight, or clear digestion issues, you should drink warm and not cold lemon water. Cold lemon water is a refreshing summer drink, especially if you have it along with mint leaves, honey, and ginger. Here are a few cold lemon water benefits. Lemon water is an affordable, low-calorie drink. An ounce of lemon juice contains only seven calories. It contains two grams of carbohydrates and sugar. 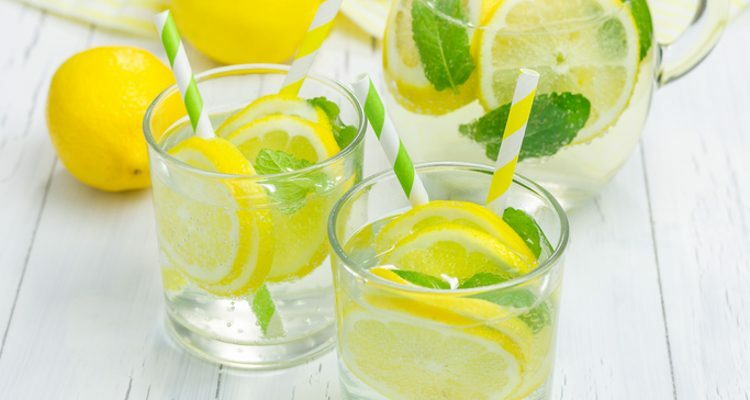 So, enjoy some lemon-flavored water to break up the monotony of drinking plain water. Cold lemon water in the morning benefits the skin. Hydration keeps the skin healthy and glowing. It helps keep wrinkles at bay. It contains a good amount of vitamin C and collagen. Collagen keeps the skin soft and healthy. It also provides natural sun protection. Vitamin C combats free radicals in the body. It prevents the oxidation of compounds within your cells. It also helps the body to metabolize cholesterol. Drinking lemon with cold water hinders the digestive benefits of lemon. On the other hand, lemon mixed with hot water stimulates the liver to produce bile, which helps move food smoothly through the digestive tract. Drinking cold lemon water for weight loss is only a myth, and it won’t help raise your metabolism. However, warm or hot lemon water encourages the body to process food slowly. Drinking lemon water 30 minutes before meals helps your body absorb most of the nutrients from food. According to a study conducted on animals and published in the Journal of Clinical Biochemistry and Nutrition, polyphenols, which are plant chemicals in lemons, may limit the increase in body fat. So, we can say that lemon water benefits us in losing weight. Drinking coffee early in the morning may elevate your mood, but it does contain caffeine. Warm or room temperature lemon water is a better early morning drink than coffee or cold lemon water. The citric scent of lemon has the power to reduce stress levels and lift your mood. Now that we know the cold lemon water vs. warm lemon water benefits, warm lemon water is more effective. However, drinking cold lemon water can be a good substitute for sugar-laden, high-calorie aerated drinks. You can safely drink it occasionally, but cold lemon water cannot be a substitute for warm lemon water first thing in the morning. How Much Lemon Water Should You Drink? Three most important factors to consider before having lemon water for weight loss are temperature, quantity, and time. To reap maximum lemon water benefits, you should know how much lemon water to drink. The human body can metabolize only 12 ounces of water at a time. If you want to drink more than 12 ounces of water, have it after an hour or so. A person weighing less than 150 pounds should use half a lemon. Squeezing half a fresh lemon into eight to 12 ounces of filtered water will cleanse your system. A person who weighs more than 150 pounds can drink the same amount of lemon water twice a day. Alternatively, you can also squeeze a whole lemon into 24 to 32 ounces of water. Drink this throughout the morning. A study published in Obesity found that people who drink two cups of lemon water before meals lost considerable weight than those who didn’t. The water helps you feel full, which prevents overeating and reduces caloric intake. You should also keep a check on the temperature of water. Drinking cold lemon water will interfere with the digestive benefits of lemon. For digestion and metabolism-related issues, warm or room temperature lemon water is more beneficial. Wash a lemon under water. Be sure to scrub it well to remove any dirt, bacteria, or pesticides. Slice up one lemon for every quart of water. The slices must be half an inch thick or less. Discard the seeds. Fill a large mason jar or a pitcher with filtered water. Put the lemon slices into the water. Stir it and close the pitcher. Refrigerate it for few hours. Lemon also goes well with fresh herbs. You can use some fresh mint, lavender, basil, or sage. You can also add some other fruits like kiwis and cherries, which will infuse more flavor into the water. After all the ingredients steep, remove the pitcher from the refrigerator. Stir gently. Strain the mixture and serve chilled. The combination of honey and lemon water helps to speed up weight loss. It is important to drink this a bit warm. However, this mixture isn’t a magical drink you should solely rely on to lose weight. You should also exercise for the best results. Honey is a rich source of antioxidants and riboflavin. This drink acts as a natural diuretic and helps in the detoxification process. You can have this warm drink first thing in the morning to reap maximum health benefits. Add warm water in a glass. Add the lemon juice and honey. Stir and drink. Ginger helps boost the metabolism and has many other health benefits. Peel the ginger and wash it. Finely grate the ginger with a zester. Add lemon juice to a glass of warm water. Then, add the grated ginger to it. Let it steep for some time. Stir and enjoy this lemon ginger detox. Cold lemon water is a refreshing and healthy beverage, especially during hot summers. It is an excellent substitute to packaged juices and soft drinks. However, if you are aiming to lose weight, warm lemon water may help in the process. Some people have cold lemon water before bed, but we do not recommend this. You can drink plain warm or room temperature water before going to bed. But to reap maximum lemon water benefits, you should have it first thing in the morning. Mohrman, J., “How to Make Lemon-Infused Water,” LEAFtv; https://www.leaf.tv/articles/how-to-make-lemon-infused-water/, last accessed April 17, 2017.
http://www.waterbenefitshealth.com/lemon-in-water.html, last accessed April 17, 2017.